PARADE TO ASSEMBLE AT 10:15 AM. The Mayor's Office and the City of Saint John invite all to gather in remembrance and thanks to those who served and sacrificed in the honour of our Country. The public is encouraged to arrive any time after 9:00 am with the Parade assembling at 10:15. 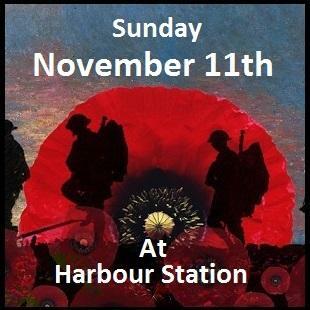 The Official Service to commence at 10:40 am and everyone is encouraged to be in their seats by this time. 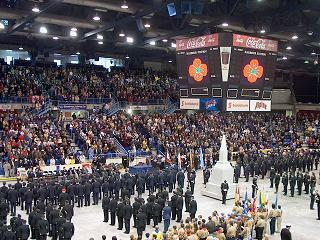 Watch the VIDEO LOOP of Saint John Veterans Pictures on You Tube. SEATING FILLS UP QUICKLY. WE SUGGEST COMING EARLY FOR THE MOST ACCESSABLE SEATS. EXTRA HANDICAP PARKING AVAILABLE ON A FIRST COME BASIS. - Parade Participants can enter at the East and West Arena Level Doors. - The Public is to enter through the Front Doors on Station St.
- The top 3 rows of the lower bowl are intended for Senior Citizens. Please be courteous and leave those seats. - Wheel Chair folks can enter from the east and west arena doors or from a drop off location at the front of the building. - There are no concessions open, but Tim Hortons and soft drink and water vending machines are available. FOR TERRY KELLY'S VIDEO AND STORY OF "PITTANCE OF TIME"
Why Remember? We must remember. If we do not, the sacrifice of those one hundred thousand Canadian lives will be meaningless. They died for us, for their homes and families and friends, for a collection of traditions they cherished and a future they believed in; they died for Canada. The meaning of their sacrifice rests with our collective national consciousness; our future is their monument.